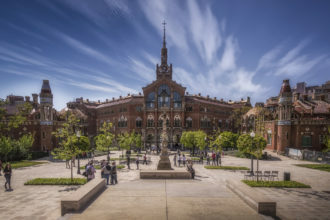 The former Hospital de la Santa Creu i Sant Pau (English: Hospital of the Holy Cross and Saint Paul) is located in El Guinardó, a neighborhood in Barcelona. It is a complex design built between 1901 and 1930, designed by the Catalan modernist architect Lluís Domènech i Montaner. Together with Palau de la Música Catalana, it is a UNESCO World Heritage Site.